When eating a main meal in a Japanese house it is usual for the family to sit on the floor, with the food being placed on a low table which people sit around. For people not used to this arrangement it can take a little getting used to. It is quite common for people to share a variety of food at the table, as opposed to serving each person an individual dish. When sharing food in this manner, it is best to use the opposite ends of your chopsticks if there are no serving chopsticks provided for the purpose of transferring food from the shared dish to individual plates. Meat and noodles is often served as a Japanese main dish, with the meat part being whatever suits your personal taste, although lamb is very rarely used in Japanese homes. First you should thoroughly beat the egg white and egg before placing them to one side. Next take the soy sauce, broth, ginger and sugar and place together in a large saucepan before bringing the ingredients to the boil. Once brought to the boil reduce the temperature and add your chosen meat along with the onions. You should leave these to simmer for approximately 2 minutes. Next add the egg mixture to the ingredients, but do not stir, and cook for approximately 2 minutes. Once you have done this remove the pan from the heat and stir in a gentle manner. 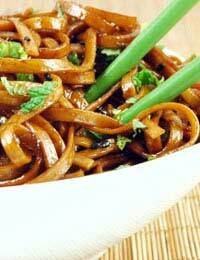 Next take 2 cups of noodles and place a cup in both bowls before adding 1/2 a cup of bean sprouts to each bowl. First, using a ridged grill pan heated to a fairly high heat and that has been lightly oiled, take the chicken meat and cook, having first added a pinch of salt and pepper, for approximately 10 minutes on each side, or until they are cooked through. Once cooked take the chicken breasts and place on a cutting board, allowing them to cool down. Next take the wheat noodles and boil for approximately 5 minutes, before draining all excess liquid and rinsing them under cold water. Next divide the noodles between the 2 plates and place the carrot, sow peas and cucumber around them. Once the chicken has cooled cut it into thin slices and add to the plates. The sauce can either be used for drizzling over the plates or as a dip.